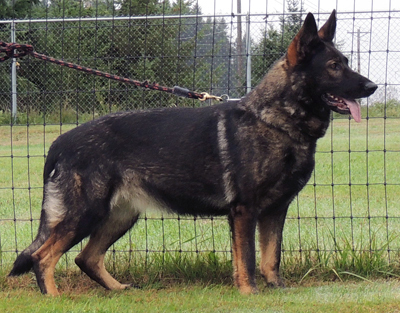 Imported from the Parchimer Land Kennel in Germany,, Xenna is a 100% DDR female with excellent DDR head and dark pigment that is known to the DDR Dogs. Xenna is a well proportioned female with very nice correct topline and underline, substantial bone and lovely expression with dark eyes. 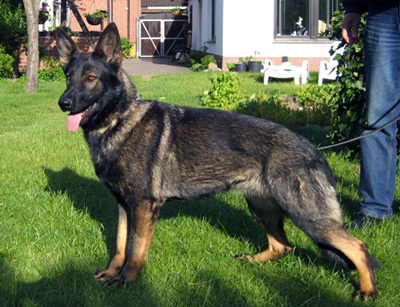 Her expression, character and head type is super and is typical of what we like to see from the the DDR dogs .Her pedigree contains such dogs as her well known and respected sire, V Dino vom Schäferliesel, V Illa von der Mittelhäuser Flur, Don vom Haus iris, V Tino vom Felsenschloß, SG Muchta vom Schwarzhorn BSP 3-3, V Dragon vom Felsenschloß, V CH (US) Neumann's Jim and the well known contributors to the breed, V Alf Körnersee, Lord vom Gleisdreieck and Don vom Rolandsteich.. making Xenna's an excellent working DDR pedigree. 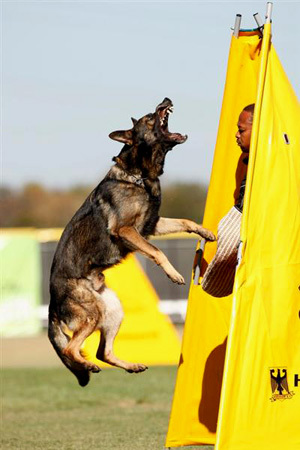 Xenna's coat color is a rich dark black sable with excellent pigmentation. 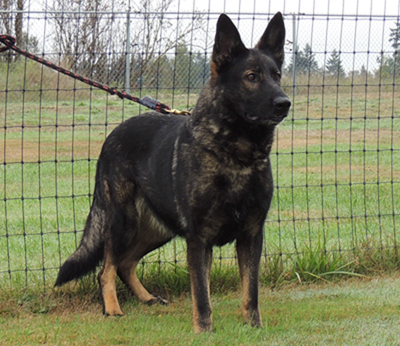 Xenna has an outgoing and free temperament. 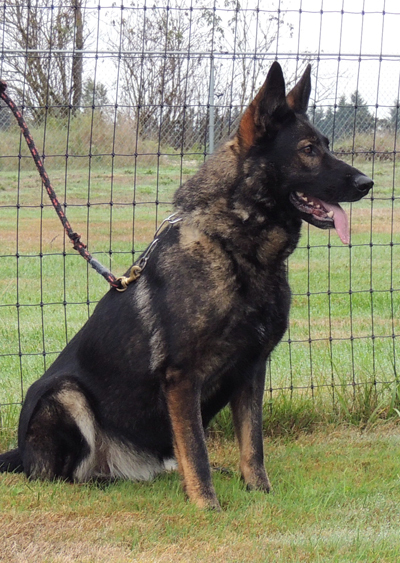 and possesses good ball drive and very good protection skills making her an excellent choice for pups which will be suitable for Family protection , Schutzhund, search and rescue and therapy dogs. 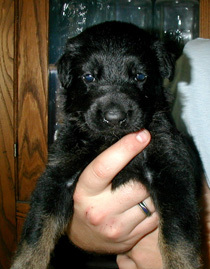 Xenna's 1st Litter was sired by the 2008 BSP Champion Javir vom Talka Marda. Sadly due to the long trip from Parchim to the airport in Frankfurt, the stress took it's toll on the litter in transport from Germany to the US, and we had only one pup survive; a lovely BiColor female which we named "Qash Mirr von Schraderhaus" who will remain in our breeding program as an integral component of our continued efforts to produce well balanced and capable working dogs for a variety of working fields, in addition to making excellent companion and home protection dogs for use within the family. We look forward to Xenna's future litters, as well as the excellent progeny produced by her daughter Qash Mirr for our kennel. 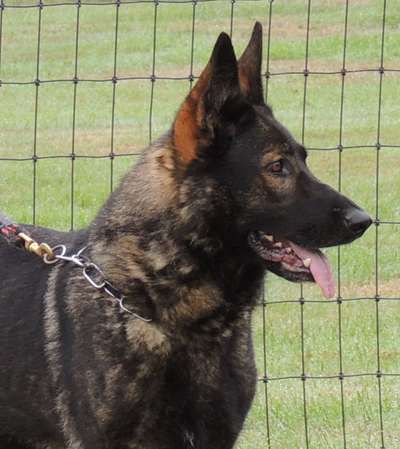 With the working pedigree from her father Javir, we anticipate Qash Mirr will produce excellent progeny for use in high level Schutzhund competition, PSA or Police Work. Qash Mirr is a strong and dominant female; yet she is social with a clear mind. Her bite work is lightening fast, with a deep bite and seriously hard grip. 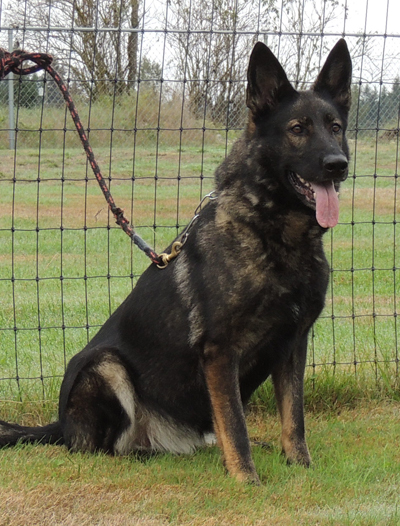 We expect her future pups to be superb for police work, high level competition sport and for use in home protection / personal protection work as well. Click on photo to view page for Javir, Qash Mirr's sire. SV Universal Sieger 2007 ! "V" Ivo von Hauental...Sch3, KKL1, Hips A1. All are dark black sable with 1 solid black female. 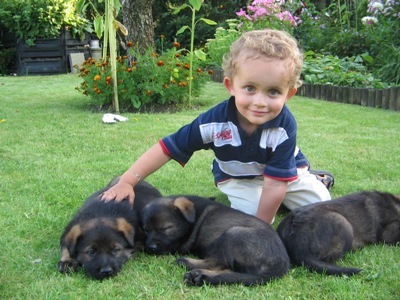 Click here to view puppy pics. 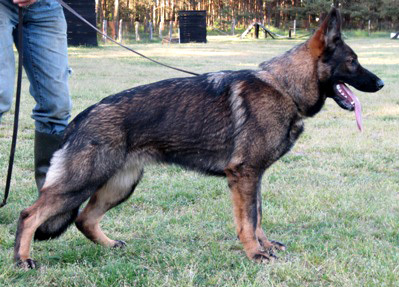 Xenna" is linebred on the following DDR Dogs..